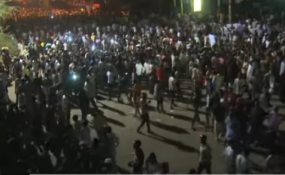 Sudan — On Saturday, the mainstream Sudan People's Liberation Movement (SPLM) in their areas of control Blue Nile state and other areas marched in solidarity with the sit-in in front of the general command of the army in Khartoum, rejecting the military council and calling for civilian government. All segments and components of society and civil society organisations of youth, women, native administrations, students, religious people and creed of African beliefs took part in the march. Demonstrators confirmed their solidarity with the steadfastness of the Sudanese people, shouting slogans and chants. Protesters from Kadugli told Radio Dabanga that the military police held three of the protesters for hours in the garrison of brigade 55 in Kadugli and then released them. Yesterday, the masses of Port Sudan in Red Sea state continued their sit-in in front of the command of the Sudanese Navy's chief of staff, demanding fulfilment of their demands. One of the protesters told Radio Dabanga that the crowds were still in front of the command of the naval staff, rejecting the military council and demanding a transitional civilian government. He said that the military council's announcement was not satisfactory to the masses. Yesterday ,the sit-in continued in front of the second infantry regiment rejecting the military council and its decision. One of the protesters told Radio Dabanga that the military commander in charge of the state administration who took over his duties yesterday addressed the crowd and asked them to leave the sit-in and continue with their everyday activities. He said the crowd rejected the move and insisted to continue the sit-in until all the demands would be met, foremost of which was the transfer of power to a civilian government with full powers and the accountability of former regime figures. Yesterday, protests and sit-ins continued in front of the military command in El Obeid in North Kordofan rejecting the military council and its decisions. One of the protesters told Radio Dabanga that the military commander in charge of the administration of the affairs of the state who assumed his duties yesterday addressed the masses in front of the military commandment and acknowledged the legitimacy of sit-ins and peaceful demonstrations. He said that the commander demanded the protesters to break the sit-in and exercise their normal lives, but the crowd insisted on staying in front of the military commandment demanding the removal of the military council and the formation of a transitional civilian government.